I spent Saturday afternoon at Gather Here joining the folks from the Boston Modern Quilt Guild for their May meeting and also participating in the Quilts for Boston wrap up. As you may know, the BMQG started Quilts for Boston as a way of doing something positive in response to the marathon bombing, and Gather Here has been supportive of their efforts for this cause. 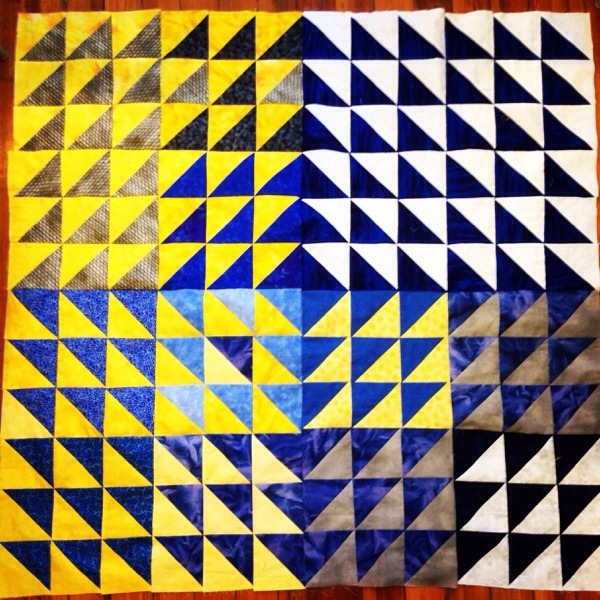 The response to their call for quilt blocks was phenomenal with blocks coming in almost a year past the deadline. One of the guild’s goals for this meeting was to use up all these leftover blocks, make a few more tops, and get the last few quilts finished and on their way to their recipients. There was a sewing room swap, a lively show and tell, and then lots and lots of sewing, amidst conversations about Quilt Market, new patterns, the quilt show at the MFA, and Jay-Z and Solange. I was helping folks get set up for sewing and catching up with folks I hadn’t seen in a while before I got into the blocks and started sewing. I got super-lucky in that I came across all these blocks that another guild had made hoping to provide a ton of blocks with some continuity. So smart! I stitched them up lickety-split. There’s something immensely satisfying about sewing together blocks that other people have made. I mean, really, they did the hard part for you. You just get to play with the overall design. It was freeing to just sit down and sew and not have to think about anything (and drink coffee and chat to the person next to you). It was a pleasure to finish up yet another top to add to the lot.